ALEXANDRIA, VA, June 29, 2016 – Of the 26 “major” hurricanes (Category 3 or greater) over the last decade, remarkably none have struck the US. However, with Tropical Storm Colin — the earliest third storm on record when it struck Florida June 5 — BoatUS recommends taking time now to develop a plan for the boat to weather the next storm or hurricane. While predictions for the number of storms are near normal for 2016 Hurricane Season, you really can’t rely on them,” said BoatUS Seaworthy Editor Charles Fort. “Predictions don’t tell you where a storm may strike. 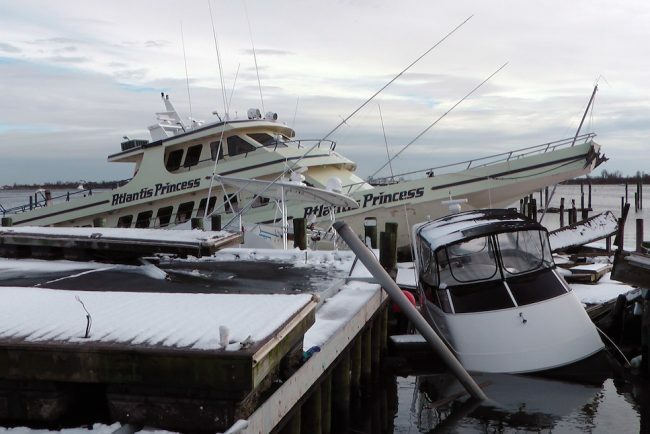 Boat owners also need to understand that it doesn’t take a big storm to damage their boat. Colin was relatively weak, but when it came ashore it still damaged boats in the Big Bend region of Florida. Can you count the number of boats in this photo that were damaged by 2012’s Superstorm Sandy? (Answer: 4). You don’t have to start from scratch: Check out the range of free hurricane preparation information developed for boat owners and marinas at BoatUS.com/hurricanes. Easily downloadable storm-planning materials include a hurricane preparation worksheet, in-depth Boater’s Guide to Preparing Boats and Marinas for Hurricanes, up-to-the-minute storm tracking tools with live satellite images, and checklists for what to do before and after a hurricane strikes. Sample hurricane plans for boat and yacht clubs are also included. Learn at home: Take the Hurricane Preparation for Boaters online course from the non-profit BoatUS Foundation and US Power Squadrons. From the comfort of home, you’ll be able to create a hurricane plan for your boat, better understand your marina’s or storage area’s storm protection, and learn when and how to move a boat should move before a hurricane. The course also details the steps needed to take before a hurricane makes landfall and how to secure a boat for hurricane conditions, including diagrams for tying lines. The $30 course fee is currently discounted 20% when using promotion code “STORM” at BoatUS.org/courses. Make your boat’s hurricane plan now.